Contest winner – copy of Danny Pettry’s book! Tampa Bay Parenting Magazine (Tampa Bay, FL). The Parthenon – Student newspaper at Marshall University (Huntington, W.Va). The book has a 5-star rating from amazon.com reviewers! Testers were delighted to discover this storybook that teaches children important lessons about tolerance, empathy, sharing, compassion and much more. Pettry uses adorable dogs and puppies to illustrate these good character traits. Parents noted how well the book was written. The style easily connected with children and was fun for parents to read. What many parents told us was that this book sparked conversations about various behaviors including how humans and dogs share many similarities when it comes to caring for each other. 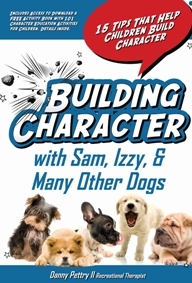 Building Character with Sam, Izzy, and Many Other Dogs: 15 Tips to Help Children Build Character.